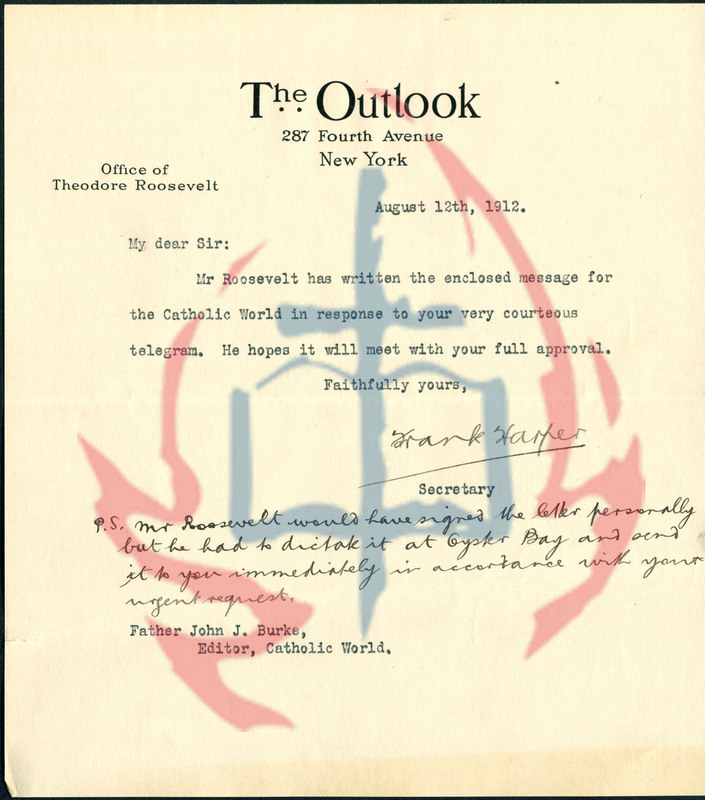 This two-part telegram pictured left was written to Father John J. Burke of the Catholic World newspaper from Secretary to the President of the United States Frank Harper, and from President Theodore Roosevelt on August 12th and 13th, 1912. John J. Burke was a priest with the Paulist Fathers in New York City and the editor for the Catholic World. The telegram chooses this title to address him by, recognizing his role as the editor of the newspaper. The Catholic World ran from 1865-1996 and became increasingly popular during the First World War. Theodore “Teddy” Roosevelt was born in 1858 in New York City. He became the 26th President of the United States in 1901 after the assassination of President William McKinley. He was an advocate for justice and is often quoted with the familiar saying, “Walk softly and carry a big stick.” He was the youngest man to ever become President at just forty-three years old. Roosevelt received the Nobel Peace Prize for his work to end the Russo-Japanese War. He died in his sleep at sixty in January 1919. The letterhead on the telegram says “The Outlook – 287 Fourth Avenue – New York,” which was a weekly magazine published between 1870 and 1935 in New York. Roosevelt was an associate editor for the magazine and published various articles over the years. The first page of the telegram is dated August 12th, 1912 written by Roosevelt’s Secretary, Frank Harper. It states that there is an enclosed message from President Roosevelt himself. At the bottom of the first page, Harper has handwritten an apology that Roosevelt did not sign the letter personally but had to dictate it while at Oyster Bay and send it out immediately. Oyster Bay was located in Long Island (now known as Sagamore Hill) and is where Roosevelt spent many summers growing up and lived with his family until his death. The second part of the telegram is addressed to Burke from Roosevelt. It discusses his sincere apologies for the death of Father Alexander P. Doyle. Doyle was also a Paulist Father and a close friend of Roosevelt. As the telegram explains, the two met seventeen years prior while Roosevelt was Police Commissioner. Doyle was one of the first people who encouraged Roosevelt to take a public stance on an issue they both felt strongly about: race suicide. This happens when members of a specific race are unwilling to reproduce causing the birth rate to fall below the death rate. Roosevelt also mentions a Father Casley who there is little information on, but was also a good friend of both he and Doyle. Roosevelt, T. (1909). Outlook Editorials. 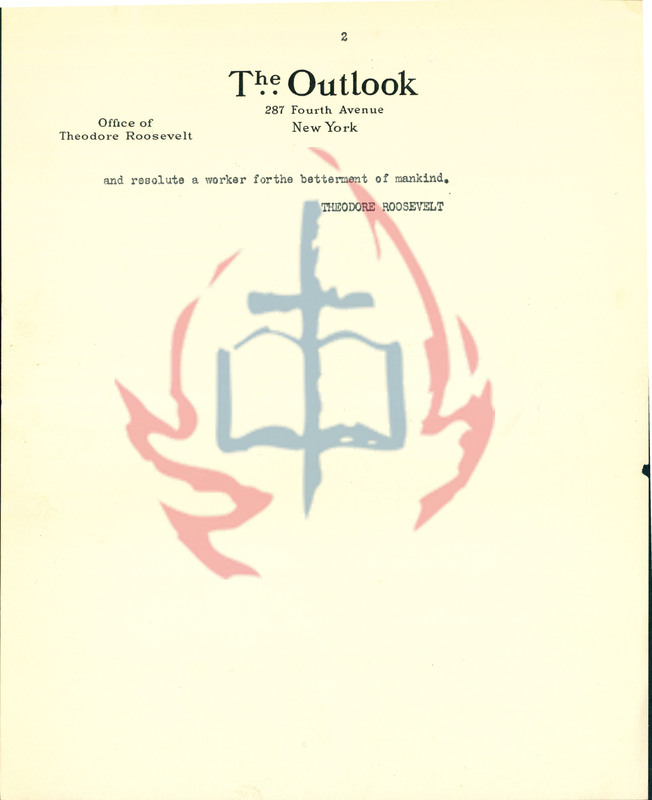 New York, NY: The Outlook Company. 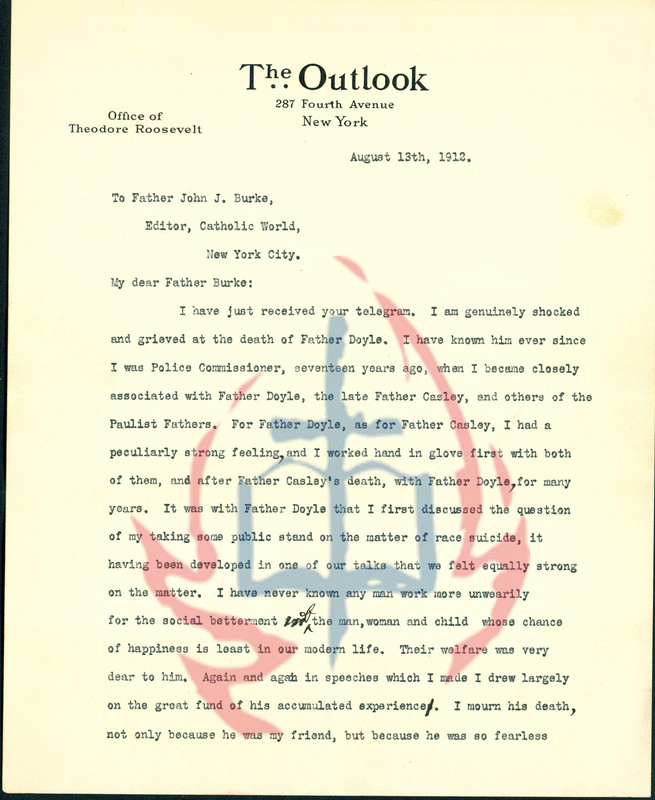 This entry was posted in Paulist Fathers and tagged alexander p. doyle, father casley, john j. burke, paulist fathers, teddy roosevelt, the catholic world, the outlook, theodore roosevelt. Bookmark the permalink.